How Much Does a DSLR Weigh? 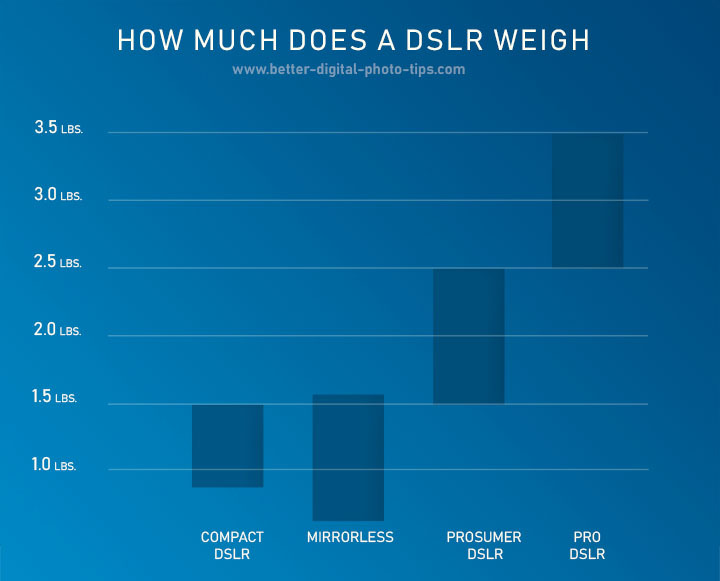 You want to know how much does a DSLR weigh. It's important to know how heavy a DSLR is before you buy one. After all, if it's too heavy to lug around you won't use it and that would be a big waste of your money. The average DSLR weight is between 1.5 and 2.5 pounds. To give you some perspective, two pounds is about the same (110%) as a quart of milk. Here's a quick weight comparison of the average DSLR weight for a few of the classifications of DSLR types. Yes, this article is about how heavy DSLR (digital single lens reflex) cameras are but I also included mirrorless cameras too. With the dramatic improvements in technology, mirrorless cameras are gaining popularity. Eliminating the mirror and prism from the body, in general, makes them smaller, lighter and easy to use. DSLRs and mirrorless are different in many ways, but they do share the benefits of superior image quality and interchangeable lenses. Remember the weight of the lens. When you're considering the maximum weight you want to carry, a big mistake is to forget factoring in the weight of the lens. 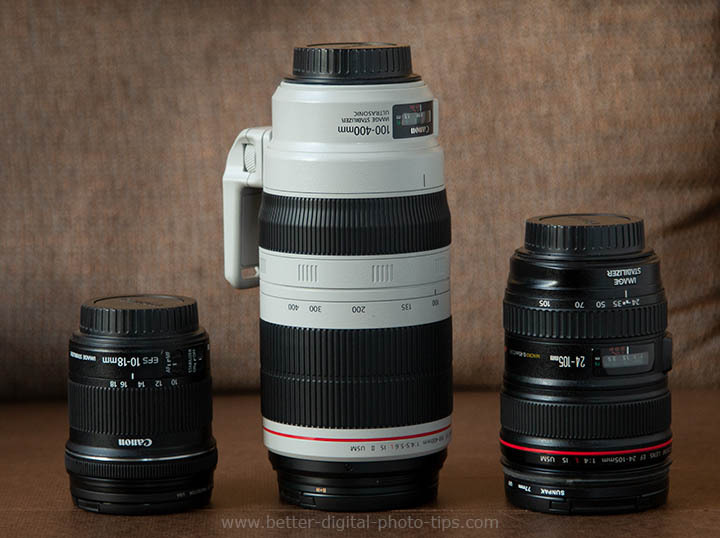 Lenses vary even more than DSLR camera bodies in terms of size and weight. Here's what I mean by that. Below is a photo of 3 lenses I use on my Canon 70D, a crop sensor that weighs 1.7 pounds by itself without any lenses attached. The chart below shows how much a Canon 70D (An APS-C "crop sensor" camera) increases in weight by adding on 3 different lenses. I use the smallest lens in the photo, the 10-18mm, when I want to shoot really wide views of landscapes. You can see it only adds 29% more weight to the weight of the body alone. 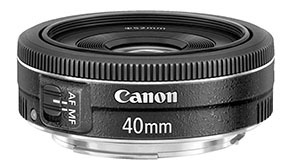 The medium-sized lens, the 24-105mm, is my general purpose lens and I use it more than any other lens, except when shooting portraits. With that lens attached the weight of my DSLR almost doubles (82%). Compare that with the telephoto zoom attached, the 100-400mm lens. That triples the weight of my small DSLR from about 1.7 lbs to 5.2 lbs. If you were to compare the weight of a flat pancake lens with the weight of a massive 600mm f/4.0 lens on a lightweight DSLR, the difference in weight gain becomes almost comical. The 600mm lens weighs about 41 times as much as the pancake lens. That's one of the big reasons why some photographers use pancakes lenses. Small and light. They're prime lenses, meaning Non-zooming, so image quality should be excellent. I make a big deal about this because the lens you use makes a big impact on how much your camera weighs and how it handles. You can see by the chart at the beginning of this post above, that full frame DSLRs are the heaviest and mirrorless cameras are the lightest. The opposite is true if you compare a full frame sensor mirrorless with the world's smallest DSLR camera. The full frame mirrorless are heavier than the super compact DSLRs. That make sense because the camera bodies have to be larger (and heavier) to fit a full size sensor inside. how much does each digital camera weigh? Here's a graphic comparison of the largest and smallest digital camera from the chart above that shows you why there is such a huge difference in what these 2 cameras weigh. There isn't much wasted space included inside DSLR or mirrorless cameras except the area in front of the sensor. There's an obvious direct relationship between the overall size of a camera and it's weight. 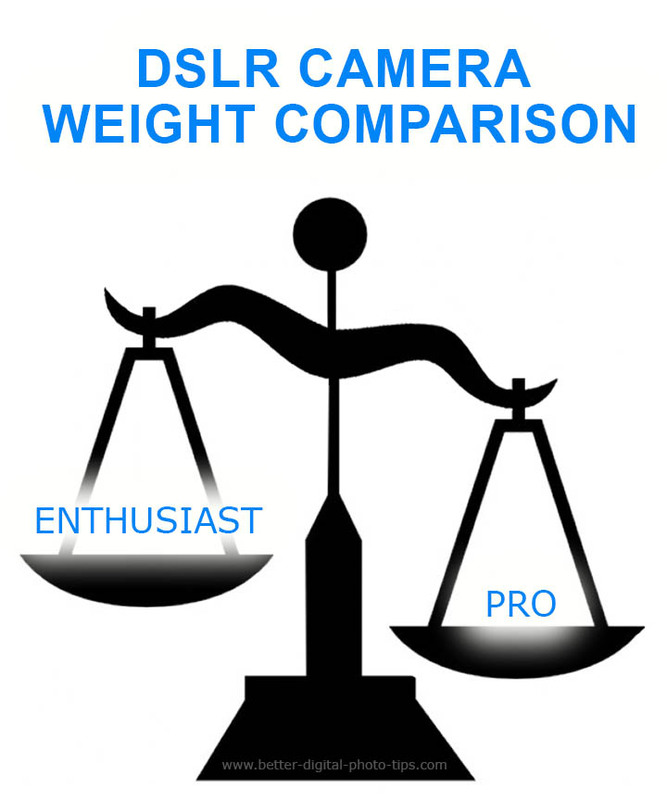 Here's a really great tool you can use to do a DSLR weight comparison: Compare DSLR Weights. You can and compare DSLRs, mirrorless, and some point and shoot cameras in a side by side size and weight comparison. The actual weights of the cameras are compared below each camera in small print. If you are seriously interested in how much one of your favorite cameras weighs, it's a good idea to confirm it on the company's website or a professional camera review site. Living in the USA, I compare by using weight in lbs. not grams, and sometimes websites can report inaccuracies. You have several ways to find out the exact weight of your camera or any other specific model. You can use the speed of Google by being specific in your search terms, such as "How much does a Canon 80D weigh." You can also search out weight, size and other specifications by searching like this: " Nikon d700 specs." A guy who worked for Kodak, Steve Sasson, invented the first digital camera in 1975. It weighed about 8 lbs. That's the same weight as a gallon of milk. Can you imagine carrying around a camera that heavy? That first camera was not a DSLR and it's resolution was 100x100 pixels or about 0.1 megapixel. The image was recorded on a cassette tape and was only a grainy looking black and white photograph.